Overseas France (French: France d'outre-mer) is the part of France that is outside of the European continent. It consists of all overseas departments, territories and collectivities. These territories have several different legal statuses and levels of autonomy. Overseas France includes island territories in the Atlantic, Pacific and Indian oceans, French Guiana in South America, and Adélie Land in Antarctica. 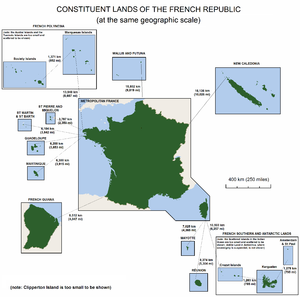 Each inhabited territory is represented in both the French National Assembly and the French Senate (which together make up the Parliament of France). 2,685,705 people lived in the overseas departments and territories in January 2011. Overseas departments and regions are completely part of France. From 1976 to 2003, Mayotte was a unique overseas territory. Between 2003 and 2011, it was an overseas community. It became an overseas department on 31 March 2011, after its citizens voted to become a full part of France. The category of overseas collectivity was created by changes made to France's constitution in 28 March 2003. Each overseas collectivity has its own written laws. From 1946 to 2003, French Polynesia was an overseas territory. In 2004, it was given the designation of overseas country (French: pays d'outre-mer). From 1976 to 1985, Saint Pierre and Miquelon was an overseas department. Between 1985 and 2003, it was a unique overseas territory. From 1961 to 2003, Wallis and Futuna was an overseas territory. Saint Martin and Saint Barthélemy both separated from Guadeloupe in 2003. They became separate overseas collectivities of their own on 22 February 2007. New Caledonia was classified as an overseas territory from 1946. It gained a special status in 1999 as a result of the Nouméa Accord. It has its own citizenship, and power is gradually being passed from the French state to New Caledonia itself. A referendum on independence is to be called any time between 2014 and 2019. Clipperton Island is held as private property under the direct authority of the French government. It has no permanent population. The overseas departments and territories are represented by 27 députés in the French National Assembly and 21 senators in the French Senate. This is 4.7% of the 577 députés and 6% of the 343 senators. New Caledonia Nouméa 244,410 (Jan. 2008) 18,575 Sui generis collectivity South Pacific Ocean Referendum for independence to occur sometime during the period of 2014 to 2019. Saint Barthélemy Gustavia 8,450 (Jan. 2007) 21 Overseas collectivity Antilles Detached from Guadeloupe on 22 February 2007. Saint Martin Marigot 35,925 (Jan. 2007) 53 Overseas collectivity Antilles Detached from Guadeloupe on 22 February 2007. Lands generally uninhabited, except by researchers in scientific stations. ↑ "French Caribbean voters reject change". Caribbean Net News. 2003-12-09. Retrieved 2007-02-09. However, voters in the two tiny French dependencies of Saint-Barthélemy and Saint-Martin, which have been administratively attached to Guadeloupe, approved the referendum and are set to acquire the new status of "overseas collectivity". ↑ Magras, Bruno (2007-02-16). "Letter of Information from the Mayor to the residents and non-residents, to the French and to the foreigners, of Saint Barthelemy" (PDF). St. Barth Weekly. p. 2. Retrieved 2007-02-18. On February 7 of this year, the French Parliament adopted the law granting Saint-Barthélemy the Statute of an Overseas Collectivity. ↑ "Saint-Barth To Become An Overseas Collectivity" (PDF). St. Barth Weekly. 2007-02-09. p. 2. Retrieved 2007-02-09. ↑ Institut Statistique de Polynésie Française (ISPF). "Enquêtes & Répertoires > État Civil". Retrieved 2009-09-14. ↑ (French) INSEE, Government of France. "INSEE Infos No 32" (PDF). Retrieved 2007-12-02. ↑ (French) Institut de la statistique et des études économiques de Nouvelle-Calédonie (ISEE). "CHIFFRES CLÉS - Démographie" (PDF). Retrieved 2009-01-13. This page was last changed on 19 October 2015, at 07:26.